The drama around the Last Supper details a Great Mystery, because here we see the cosmic necessity for the Devil, as the one who affirms the design. The role of Devil can be one given according to Fate’s dictate or being caused by one being appointed to uphold this dignity. In all instances, the Devil is the one who marks the outer limits of possibility, the contraction of the worlds in pain or delight as it affirms beauty and bliss. In its more profane activities, the appointed Devil is merely perceived as a troublemaker, a nuance, a slanderer, a liar – a wayward son of Mercury by all measure. Still, by being appointed as the Devil a tension is established that affirms the agenda of him or her who has appointed their accuser – the accuser will then affirm the truth and the lie by mere existence. Commonly ‘devil’ and ‘demon’ are used interchangeable, but it is important to make a distinction here. If we follow the earliest Greek transcript of the Holy Bible, the Vatican Manuscript no 1209, also known as the Emphatic Diaglott it is interesting to note that in the Gospel of John chapter 6 where Jesus appoints Judas to be his devil the original Greek word is diabolos. In other passages where KJV uses devil, such as throughout the 11th Chapter of the Gospel of Luke we find the Greek daimone/demon being used. In KJV this distinction is absent and devil is the translation both of diabolos and daimone. Diaglott makes clear to us that the chief of the demons is Baelzebubth/Baelzebub – and it was by the aid of Baelzebub that Jesus the Christ was accused of controlling the demonic host. There is no connection here with demons always being diabolos. Barry W. Hale comments concerning this in his excellent demonological treatise Legion 49 that ‘Diabolus’ also can be interpreted as ‘down-flowing’ and not only as ‘accuser’. This observation is interesting because the 'Diabolus' can then be seen as what flows down or falls down as a celestial eidolon made flesh embodying a particular intent that is made into revelation by the act of accusing. Now, the diabolic quality, namely the accusation, must not be understood as being solely of a nefarious or profane category – because this will be to make the mystery vulgar. As John 6 demonstrates, this is a mystery embedded in the cosmic design. Concerning this Hale mentions in a comment upon Matthew 12: 25 that we are here speaking of a ‘kingdom divided against itself’. The diabolic mystery and the accusation and slander that take shape within are related to division from within itself. The saint for division within itself must be Judas Iskariotes. Judas Iskariotes, the appointed devil was instrumental in the fulfillment of purpose by betrayal and accusation. By the division within he affirmed the design. The affirmation of the saviors design came with the promise of ill repute and slander upon his legacy found its release in the hanging by the silver path. This theme also shed light on the enigmatic comment in the Eddas that speak of the hanging of Odin as a sacrifice of himself to himself, the nine nights itself revealing the presence of the silver path and key, – to affirm the temporal division and reestablish unity. Upon this we can see in the cross the timeless symbol for balance, interaction, sacrifice, manifestation, unity and potency. In the cross the circle is ‘squared’ and thus the timeless is made manifest along the river of repetition in the lands of difference. In Bogomil lore, as in some Sufi silsilyah and tariqah, the Diabolus whether he holds the name Satanael, Iblis or any other of his many names, is considered to be the power that set boundaries and affirms creation. Curiously, these thoughts are also expressed by Maria de Naglowska and her exposition upon the Third Term of the Trinity where Judas Iskariotes assumes a similar role in relation to the drama of salvation around Jesus the Christ. Naglowska also touches upon the deeper meaning of the hanging itself that Iskariotes went through carrying its own salvation by affirmation and the remorse born by love. 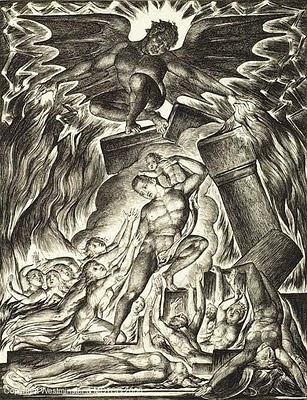 It seems to me that devil as in demon represents in general any foreign deity or spirit and particularly the fallen court of angels, while devil as in Diabolus is more reminiscent of an office, a function – a verb, in conformity with the Mesopotamian juridical function of the ha-satan, the accuser, who could be material or immaterial. It follows from this that an angel, fallen or not as well as a man can assume this function either by Fate or by being appointed. As such the slander directed towards the Diabolus take the form of a fire that enables the accuser to affirm the truth veiled within the slander. In the face of slander the Devil will only reply the only thing proper for the office, namely ‘may you be blessed’. The juridical function of the accuser was to provoke the truth to surface by protruding to be the Company of the Lie. This function translated into a metaphysical understanding will then take the form of affirming the truth. The truth must not be confused with facts, but rather to be the purity of a particular Idea or form. It takes, by all form and intent the full depth what Robin the Dart, Magister of The Clan of Tubal Cain often states as its premise, namely: ‘May the Word protect you from the Lie’. This being recognized, so can also the proper station for the form be perceived, just as Word became Flesh - because at the heart of this drama lies perception, free from corruption, whole and pure in how it perceives the world and its ways.